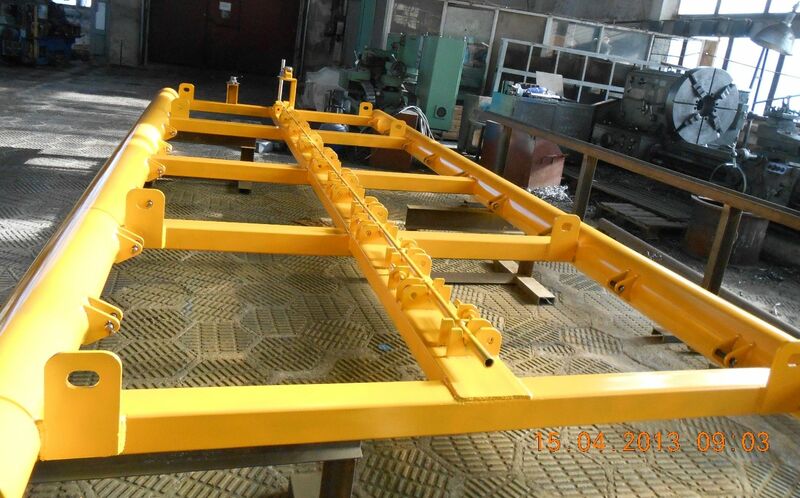 The metal frame for laying of UFPCM is a universal construction, to which with the help of a sling attached from the bottom of the concrete mat. 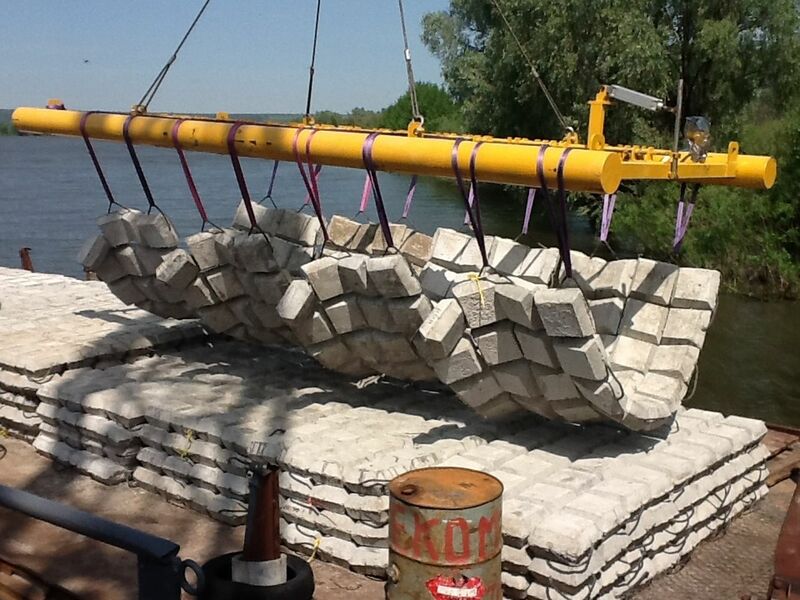 UFPCM piling using frame can be proceeded both from the boats and from the shore with the help of a truck crane. After the frame is fixed above the piling location, special lever/rod disconnects the fastened strops, for the loose lowering of UFPCM under water. If a great number of UFPCM is laid, a traverse is used, for piling several mates simultaneously, that allows to reduce charges on diving and other works related to UFPCM under-water piling. It is possible to use a traverse with the pneumatic mechanism of UFPCM removal of slings. 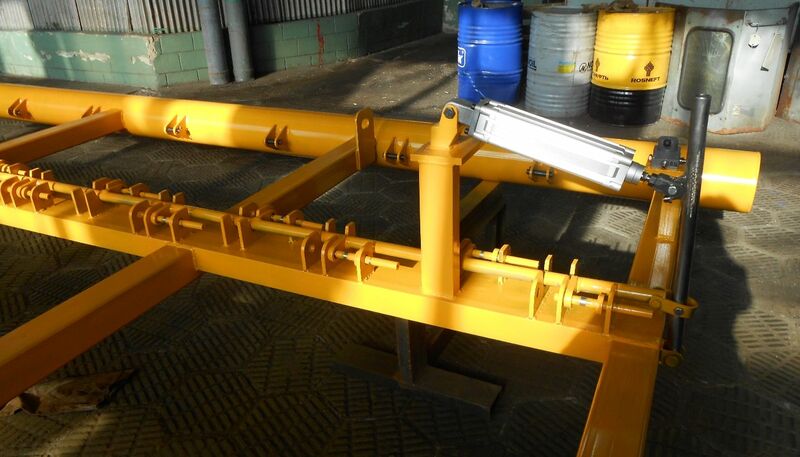 The mechanism of the removal of mat’s slings consists of central barbell with clips connected to pneumatic cylinder via a lever. Feeding of the pneumatic cylinder is performed through the oxygen hose connected to the compressed air reservoir. The work of the traverses is performed via a lifting faucet by means of which a traverse shifting is moved to the zone of mates piling. Levelling traverses relatively protected area produce divers when picked up cargo at a distance of 15-20 cm from its surface. 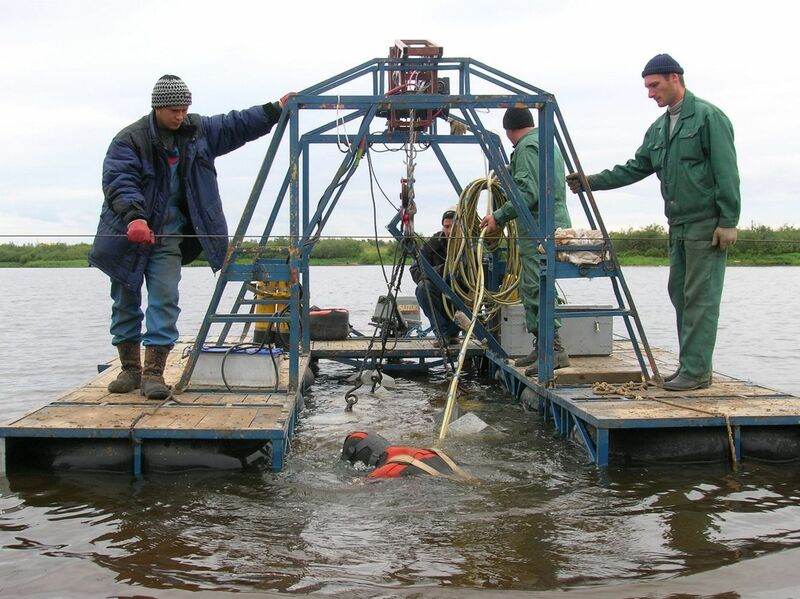 The removal of mate slings is performed at the full lowering traverses directly in the place of laying of mates by means of the three-pass faucet located on a traverse, or remotely. Traverse can be additionally equipped with the system of automatic sling removal, a spotlight, a video camera. 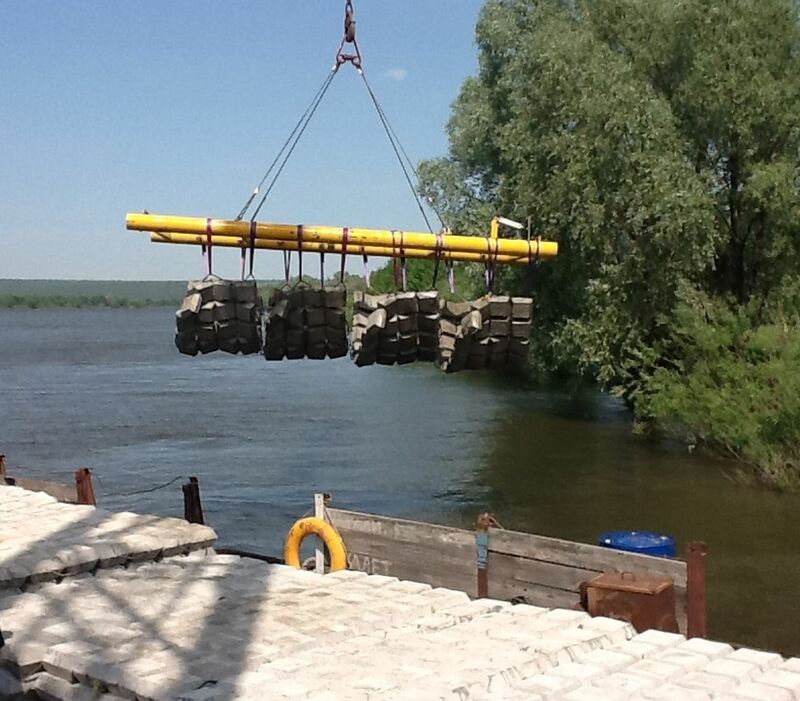 For UFPCM piling in middle and large depths the floating platform (cargo catamaran) is used, equipped with a lifting mechanism. A collapsible design and small sizes of catamaran allow to deliver it even to objects of difficult access using cargo transport. Installation of catamaran on the working area takes from 2 to 3 hours. Плавучесть конструкции создается за счет накачанных воздухом шин для грузового автотранспорта. Катамаран оснащается лодочным мотором мощностью 20-40 л.с. для передвижения по водоему и лебедкой (механической или электрической) грузоподъемностью 2-5 т. для укладки УГЗБМ под воду. На плавучей платформе может устанавливаться водолазное оборудование для производства подводно-технических работ. 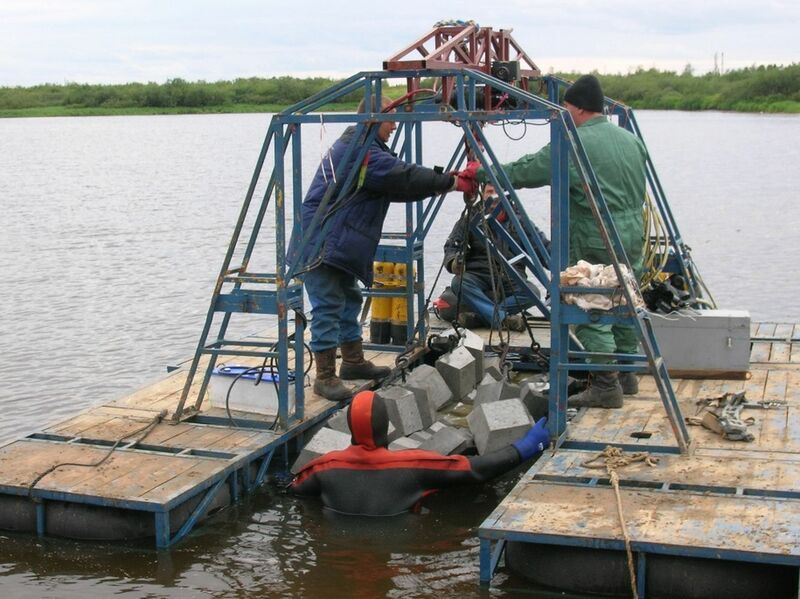 The buoyancy of construction is created by the air pumped tires for cargo transport. A catamaran is equipped with a boat engine (with power of 20-40 h.p.) for moving on a reservoir and winch (mechanical or electric) with a carrying capacity 2-5 tons for UFPCM under-water piling. 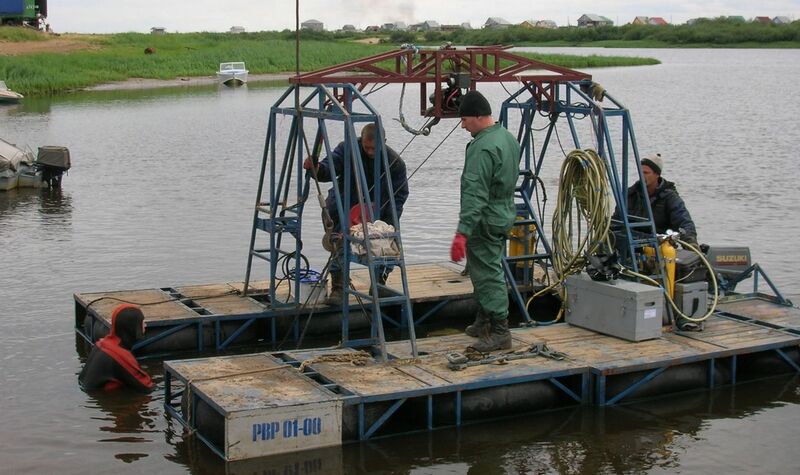 On a floating platform diving equipment can be set for the performing of of underwater-technical works. 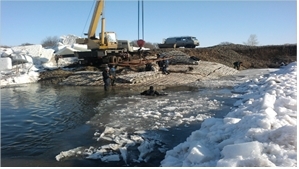 Fixing the catamaran above the work object is made withmetal tow strained between reservoir banks on the axis of the protected pipeline. After floating platform is fixed above the work area, a diver orientatesUFPCM to the piling place and gives instructions/commands for the loose lowering of UFPCM under water.